While both forms of exercise reduced motor symptoms at six months of exercise, participants who did weight training saw a 7.3 point improvement in their UPRDS score after two years while the fitness counts group turned to the same scores they had at the start of the study. That’s right…a net improvement over 2 years. Most people with PD would be happy to maintain the same level, so technically both groups are winning…illustrating the importance of exercise. 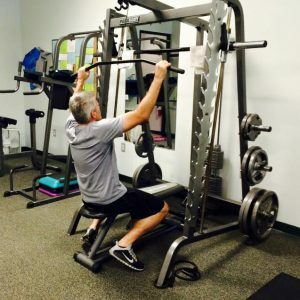 But the weight training group seeing improvement shows that vigorous exercise can not only maintain, but can improve the patient’s Parkinsonian symptoms. 2 years…coincidentally, that’s where I am in my journey with PD right now. With a net improvement. I’m setting small goals one day at a time. Pushing forward one small victory at a time. Previous Previous post: Does vigorous exercise have a neuroprotective effect in Parkinson’s Disease?